Welcome to the era of Supercomputer Gaming. With the DNA of the world’s fastest supercomputer and the soul of NVIDIA’s Kepler architecture, the EVGA GeForce GTX TITAN is a revolution in PC gaming performance. The EVGA GeForce GTX TITAN combines extraordinary power, advanced control features with EVGA Precision X, and game-changing thermal and acoustic capabilities to provide an entirely new class of super-performance graphics cards. NVIDIA SMX Engine – The new Kepler SMX streaming multiprocessor is twice as efficient as the prior generation and the new geometry engine draws triangles twice as fast. The result is world class performance and the highest image quality in an elegant and power efficient graphics card. NVIDIA GPU Boost 2.0 – Dynamically maximises clock speeds to push performance to new levels and bring out the best in every game. Boost 2.0 allows complete control over Temperature Target and Power Target, allowing a new way to customise your overclock. Also, with the new EVGA Precision X, you can increase the voltage for maximum over clock! 6GB of Onboard GDDR5 Memory – Yes, you read that right. A full 6144 MB of high speed, GDDR5 memory, perfect for the latest games at ultra settings in NVIDIA Surround. If you want to max out the texture quality on the latest games, a large enough frame buffer is essential for maintaining smooth gameplay. 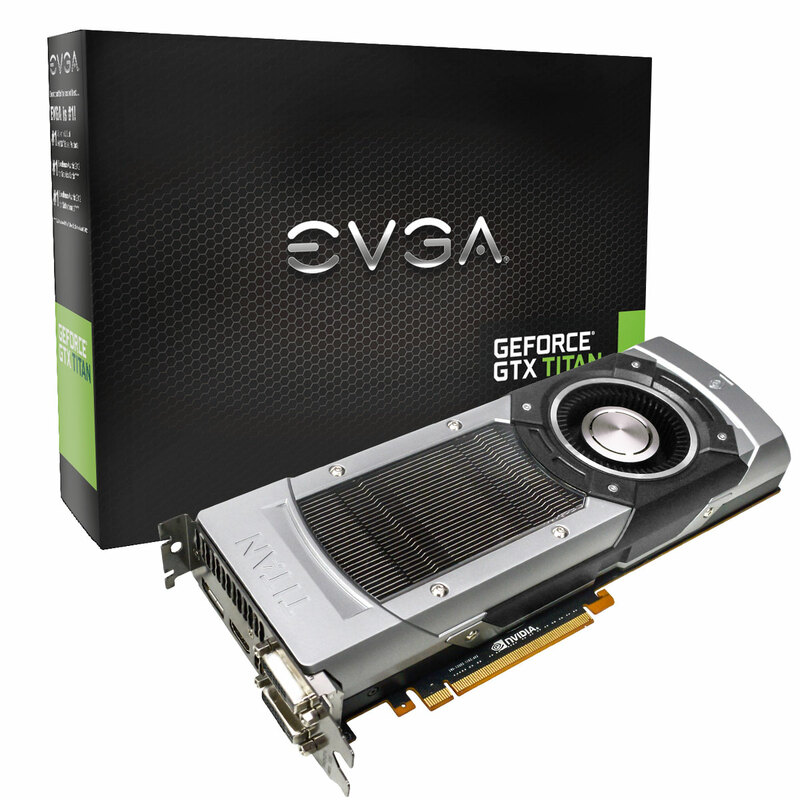 The EVGA GeForce GTX TITAN has enough for today’s and tomorrow’s high resolution games. NVIDIA FXAA – Anti-aliasing smoothes out jagged edges but can be demanding on framerates. FXAA is a new anti-aliasing technology that produces beautiful smooth lines with minimal performance impact. And with Kepler based GPUs, you can enable FXAA in hundreds of game titles through the NVIDIA Control Panel. NVIDIA TXAA – An in-game option that combines MSAA, temporal filtering, and post processing for even higher visual fidelity. Get the image quality of 8X MSAA with the performance hit of only 2X MSAA. This means a smoother gaming experience without the loss in FPS normally associated with this level of eye candy. NVIDIA Adaptive Vertical Sync – Nothing is more distracting than framerate stuttering and screen tearing. The first tends to occur when framerates are low, the second when framerates are high. Adaptive V-Sync is a smarter way to render frames. At high framerates, V-sync is enabled to eliminate tearing; at low frame rates, it’s disabled to minimize stuttering. It gets rid of distractions so you can get on with gaming. Frame Rate Target – Set a target Frame Rate with EVGA Precision X and your card will automatically adjust the power/performance to meet that target. This feature delivers the ultimate in efficient gaming. NVIDIA 3D Vision Surround – Imagine expanding your gaming real estate across three displays in full HD 3D for a completely immersive gaming experience. With the EVGA GeForce GTX TITAN, you can also use award-winning NVIDIA 3D Vision technology to build the world’s first multi-display 3D gaming experience on your PC. Additionally, the GeForce GTX TITAN supports an accessory display for the ultimate gaming experience! PCI Express 3.0 – Offers double the bandwidth of PCI Express 2.0, for the highest data transfer speeds to allow for maximum performance in bandwidth-hungry games and 3D applications. The GTX TITAN is still backwards compatible with all existing PCI Express motherboards. Pixel Clock Control – Use EVGA Precision X to “overclock” your refresh rate. With the latest EVGA Precision X, you can now increase your pixel clock! This allows for increased refresh rates on select monitors, meaning smoother gameplay and reduced screen tearing! Vapor Chamber Cooling – This unique cooler helps lower temperatures compared to standard heatsinks. This type of cooling device uses the superior heat transfer properties of evaporation. Inside each vapor chamber is a small amount of water. As the GPU heats up, the water evaporates, removing heat in the process. As the water cools down, it condenses, and the process repeats itself. In addition to the EVGA GeForce GTX TITAN, EVGA is also introducing a new version of its popular “Precision” overclocking software: EVGA Precision X 4.0.0. Redesigned to support the EVGA GeForce GTX TITAN, version 4.0.0 adds many new features for nearly all EVGA graphics cards. Custom skins including ones created by the EVGA community!